Seeing Jesus as He Really Is takes you on a journey through the Gospels and along the way, you'll see how Jesus really lived, how He radically changed the world, and how Jesus is portrayed through the word of God. Seeing Jesus as He Really Is will help every reader know how to answer the questions that Jesus asked His disciples, "Whom do? ?men say that I am" and "Who do you say that I am?" Chapters include: Jesus and His Methods; The Sweet Presence of Jesus; The Name of Jesus; Called to Do the Works of Jesus; Pressing in to Jesus. 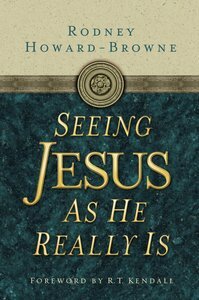 About "Seeing Jesus as He Really is"
Seeing Jesus as He Really Is will help every reader know how to answer the questions that Jesus asked His disciples, "Whom do men say that I am" and "Who do you say that I am?" El Dr. Rodney Howard Browne es evangelista y pastor de la iglesia "The River at Tampa Bay." Junto a su esposa Adonica y el equipo evanglistico recorren el mudno llevando un mensaje de avivamiento y renovacion.Estas palabras reflejan la sintesis de su mensaje: "Permite que las vendas de la religion, tradicion y pecado caigan de los ojos, para que veamos a Jesus como realmente es."